Eugenia's journey to become a TAPAS ESR has been long in terms of both time and geography. Born in the Far East of Russia (still USSR at that time), she has lived, studied and worked in the US, Saint Petersburg, Latin America, Middle East and several European countries. In 2008, a nineteen-year-old Eugenia wrote at the end of her first Term Paper: “The present study in a way constitutes for the author a preparatory stage of further studying live phonetics processes and practicing experimental phonetics”. Two more years in Saint Petersburg State University she dedicated herself to different aspects of speech research. Next stage was working in the Speech Technology Center, getting to know how the research is applied in hardware and software development, which can sometimes serve for saving people’s lives. Her own life was meanwhile full of outstanding experiences, such as data collection in Ecuadorian prisons or teaching police officers to carry out forensic voice identification. In 2014, Eugenia moved to Qatar and became a primary teacher in a British School. While teaching, she faced difficulties with children who did not seem typical and started thinking about continuing her education. Incidentally, she saw an advertisement of Erasmus Mundus Clinical Linguistics master program and after some drastic life changes was happy to apply for it. Two years in Finland-Germany-Netherlands-Finland revived and strengthened a researcher in Eugenia. She has been one of the top students in her cohort and actively participated in conferences across Europe. Eugenia has always been paying great attention to practically oriented research, and (language) technology has always fascinated her. Thus, she learnt how to use various applications for speech analysis and programming. Eugenia was already preparing to stay in Finland, bur the day a job contract from a speaker recognition project arrived, she also received a positive reply regarding the interview for a TAPAS PhD position. Three years in France and an international project of her dreams, which combines phonetics, clinical linguistics and language technology – what else could she wish for? 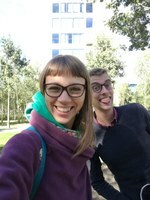 Having finished her innovative master thesis on intonation similarities between parents and children, Eugenia recently moved to Toulouse and started working on “Deep learning approaches to assess head and neck cancer voice intelligibility”, absolutely excited about the upcoming challenges. Applied linguistics, Phonetics, Clinical lingustics, Language and Speech technology, ASR, Speaker Recognition, Speech synthesis, Deep learning. Ermolaeva, E. (2010). Osobennosti intonatsionnogo oformleniya russkogo obschego voprosa bez leksiko-sintaksicheskih sredstv nositelyami turetskogo yazyka [Russian general question (with no lexico-syntactical markers) intonated by native Turkish speakers]. Proceedings of the XVII International youth scientific conference “Lomonosov-2010”, Moscow, Russia. Ermolaeva, E. (2012). Motivy apokalipsisa v narodnom predstavlenii i rechi Pinezh’ya [Apocalypse motives in conceptual and speech discourse of the Pinega region inhabitants]. In I.S. Veselova, A.D. Stepihov (Eds. ), Rechevaya i obryadovaya kul’tura Russkogo Severa: Filologicheskiy praktikum [Speech and ritual culture of the Russian North: Philological practicum] (pp. 376-384). Saint Petersburg, Russia. Kudryavtseva, E., Mal’tseva, T., Rykova, E., & Varlamova-Lerned, N. (2017). ”R”. Repka. Rabochaya tetrad’. Kniga 17 v serii “Skazkoteka” [“R”. Repka. Workbook. Book 17 in the series “Skazkoteka”]. Moscow: Osobaya kniga. Rykova, E., & Lappalainen, A. P. (2018). The skli-skla illusion: phonemic restoration of plosives from interconsonant silence. Proceedings of the International Conference of Young Philologists 2017 “Russkaya Filologiya 29” [Russian Philology 29] (pp. 525-541). Tartu, Estonia. Rykova, E. (March, 2018). Testing Russian Affective Prosody: Standardization of the stimuli for intraoperative brain-mapping tasks in awake brain surgery . Presented as a poster at the 6th MindBrainBody Symposium, Berlin, Germany. Lappalainen, A.P., & Rykova, E. (in press). The figurative language comprehension of primary school children facilitated by motor ability: A behavioural study of embodied cognition. Submitted for publication in the Proceedings of the International Conference of Young Philologists 2018 “Russkaya Filologiya 30” [Russian Philology 90]. Tartu, Estonia. Rykova, E. (in press). Perceptual and acoustic similarities between the voices of the family members: An approach ti synthesize a voice based on family-shared f0 characteristics. Abstract submitted for publication in the Proceedings of Proceedings of the International Conference "Current Issues in Applied Linguistics" 2018. Baku, Azerbaijan.